telephone, or access can be denied by simply hanging up. 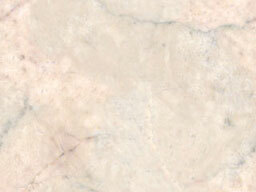 Surface or flush mount - specify which. Gold plated faceplate - Flush mount units only. can be granted or denied access directly from a touch-tone telephone. Stores up to 1000 telephone numbers. 4-digit entry codes; same number as memory ordered. 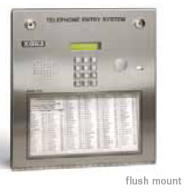 Flush mount dimensions: 13.25"H x 12"W x 3"D.
ADA compliant handset (surface mount only). 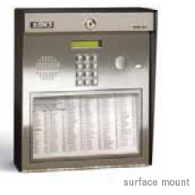 and 1837 surface mount units to recess into a wall or pilaster.